It's been a long time coming, but Amazon has finally revealed its standalone streaming service. Looking to rival Apple Music and Spotify in the over-the-air music streaming space, the newly-christened Amazon Music Unlimited will launch at a range of price points depending on how embedded you already are with Amazon's other services. So, if you're the owner of an Amazon Echo voice-activated speaker assistant, you can tap into the new streaming service for just $3.99 a month. If you're a subscriber to Amazon's Prime premium delivery service, it'll set you back $7.99 a month, while everyone else pays $9.99 a month. Even at the upper end of the pricing tiers, that's competitive with Apple and Spotify's paid options. Pricing for territories outside the US (where the service initially launches) has yet to be set, but UK, Germany and Austria are expected to get Amazon Music Unlimited before the end of the year. "Alexa, play me the King of Pop"
So, what's to separate Amazon Music Unlimited from the wide-ranging, established competition? Primarily, Alexa integration. 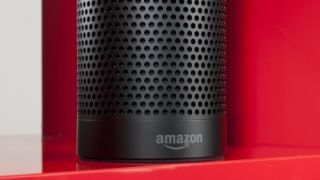 Amazon's Alexa voice assistant will work seamlessly through the Amazon Echo speaker range to play any of the service's millions of tracks from voice command prompts. You'll be able to use commands like "Alexa, play the song of the day" to hear top tracks, or even more colloquial commands like "play the King of Pop" to get some Michael Jackson playing. Alexa integration separates this from Spotify and Apple Music. Over time, Alexa will learn your favorites and listening habits, making more accurate recommendations based on your taste. With iOS and Android apps supported, and major labels including Sony, Universal and Warner onboard, Amazon seems to have its bases covered - although it's hugely possible that it doesn't have the same size of library as Spotify and Apple, given it's not explicitly stated as such. It's worth noting too that Amazon's existing Prime Music service, free as part of a Prime Subscription, will continue to be offered.